Tombone's Computer Vision Blog: What is segmentation-driven object recognition? Hi, check the winning entry in the segmentation challenge of pascal 2009. The segmentation method there produces a small number of very accurate segments, fully bottom-up. Thanks for pointing out the cool segmentation work -- the University of Bonn approach does seem promising. By the way, regarding "recognition now has to throw away 1000s of misleading segments". 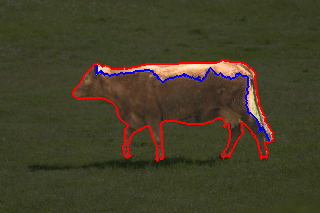 Object detection algorithms do this routinely with bounding boxes, why should it be harder with segments ? I think the problem of recognition inside segments is inherently more difficult than recognition inside sliding windows. Much of the ambiguity comes when we treat segment recognition as solving a bunch of independent binary classification problems. Since segments are free-form as opposed to rigid rectangles their variation is inherently higher dimensional. Consider what happens when you stare at a painting such as Van Gogh's Mountains at Saint-Remy -- different brush strokes seem to be combined in a plethora of ways to hallucinate objects in the painting. The longer you stare the more objects you see. Hi, please i want to aske you about the segmentation of object and detecting. because we have Graduation Project, it is system help the blind people . we search the algorthim for our project, we find "real-time algorthim 100 object recognition system"
but we want to know more about segmentation please. Hi, please can you give me some examples of videos dataset that can i use for my project in object detection and recognition in video ??? I recommend taking a look at MIT's LabelMe videos.